Explanation: What creature lurks near the red Lagoon nebula? Mars. This gorgeous colour deep-sky photograph has captured the red planet passing below two notable nebulae -- catalogued by the 18th century cosmic registrar Charles Messier as M8 and M20. 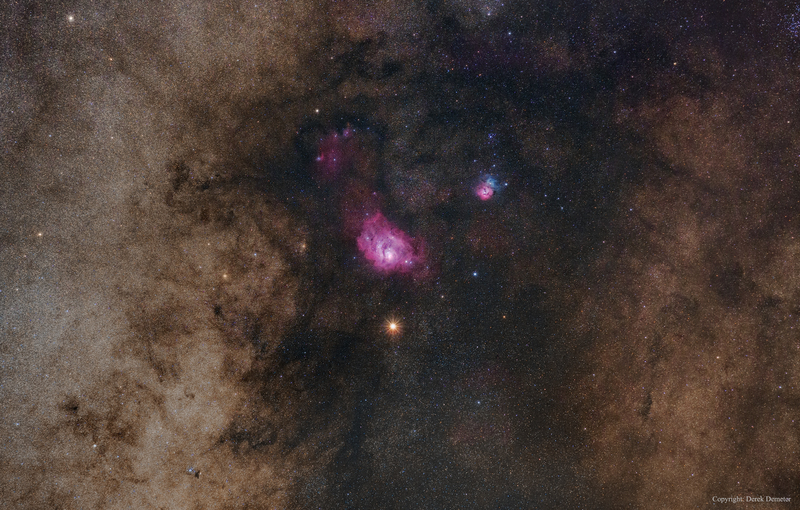 M20 (upper right of centre), the Trifid Nebula, presents a striking contrast in red/blue colours and dark dust lanes. Just below and to the left is the expansive, alluring red glow of M8, the Lagoon Nebula. Both nebulae are a few thousand light-years distant. By comparison, temporarily situated below them both, is the dominant "local" celestial beacon Mars. Taken late last month while near its closest approach to the Earth, the red planet was only a few light-minutes away.